Woodlake at Lords Creek is a Stevens Fine Homes community in Wilmington, North Carolina. It boasts a wonderful collection of amenities, including a 7 acre lake, clubhouse, swimming pool, and conservation areas. It stands in a convenient location off Carolina Beach Road near Veterans Park and the shopping area of Monkey Junction, as-well-as a short drive away from the new Pointe at Barclay, RiverLights, and Carolina Beach with all its excellent entertainment. Woodlake has the added benefit of sidewalks and a Safe Walk that leads directly to Ashley High School or Murray Middle School, so pedestrians always have a safe route to choose from and families can enjoy pleasant walks throughout the neighborhood. The community features two-story homes with two-car garages, in both European and Coastal exterior styles, on .25 acre lots. Interior floor plans boast spacious rooms, quality fixtures, solid cabinets, and ample storage spaces. 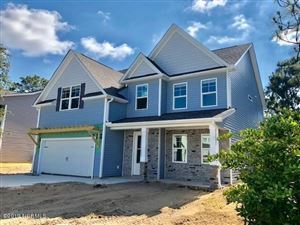 The homes all come with EnergyStar® appliances and are built with Stevens Energy Wise features, including high-rated insulation that goes beyond NC building code, 15 SEER heat pumps, Variable Speed air handlers, and radiant barrier reflective roof sheathing. Craig Stevens is a third generation builder and has constructed many homes in New Hanover, Brunswick, and Pender counties. Stevens Fine Homes has a consistent satisfaction rating of 95% with their past customers; so, buyers know they’re getting quality construction.